KOHLER Co. provides one-source responsibility for the generating system and accessories. 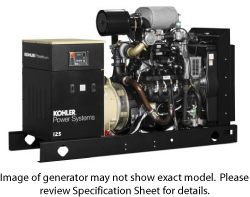 The generator set and its components are prototype-tested, factory-built, and production-tested. 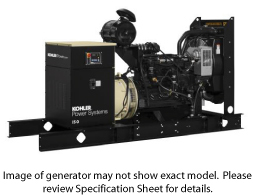 The 60 Hz generator set offers a UL 2200 listing. The generator set accepts rated load in one step. The 60 Hz generator set meets NFPA 110, Level 1, when equipped with the necessary accessories and installed per NFPA standards. A one-year limited warranty covers all systems and components. Two-and five-year extended warranties are also available. The unique Fast-Response(TM) X excitation system delivers excellent voltage response and short circuit capability using a rare-earth, permanent magnet (PM)-excited alternator. The brushless, rotating-field alternator has broad range reconnectability. NEMA MG1, IEEE, and ANSI standards compliance for temperature rise and motor starting. Sustained short-circuit current of up to 300% of the rated current for up to 10 seconds. Sustained short-circuit current enabling down stream circuit breakers to trip without collapsing the alternator field. Vacuum-impregnated windings with fungus-resistant epoxy varnish for dependability and long life. Superior voltage waveform from a two-thirds pitch stator and skewed rotor. Kohler designed controllers for guaranteed system integration and remote communication. The electronic, isochronous governor incorporates an integrated drive-by-wire throttle body actuator delivering precise frequency regulation.